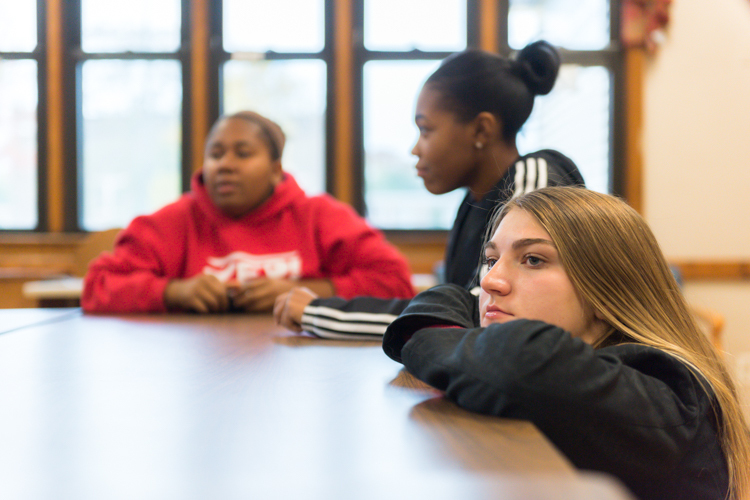 Sitting in a room flooded with autumnal afternoon light last Wednesday, a group of Muskegon High School students begin, one by one, to speak about their dreams: a world of music and teaching, of dance and college, of art and technology and understanding. Carmela Webster, a skilled trumpet player, explains she plans on studying music or art at Western Michigan University or the University of Michigan. Asia Johnson is likely heading to Grand Valley State University to pursue medicine, with the hope of becoming a pediatrician or pediatric nurse. Michael Harmon aims to attend Yale University, Michigan State, or Texas A&M University; ultimately, he wants to be a chemical engineer or video game developer. There is talk of Keyvon Carpenter going to Western Michigan University and opening his own dance studio, Desiree Taylor studying business, Miranda Terry pursuing art at such colleges as Michigan State or the School of the Art Institute of Chicago, Jada Sims attending Ferris State University or Central Michigan University, Sevastian Arriaga going the pre-med route at GVSU, and Samantha Fernandez becoming a therapist. The students know what they want, and they know how to make it happen. How did they get to a place in which talk of dreams comes so easily, to this energetic space filled with self confidence and aspirations? 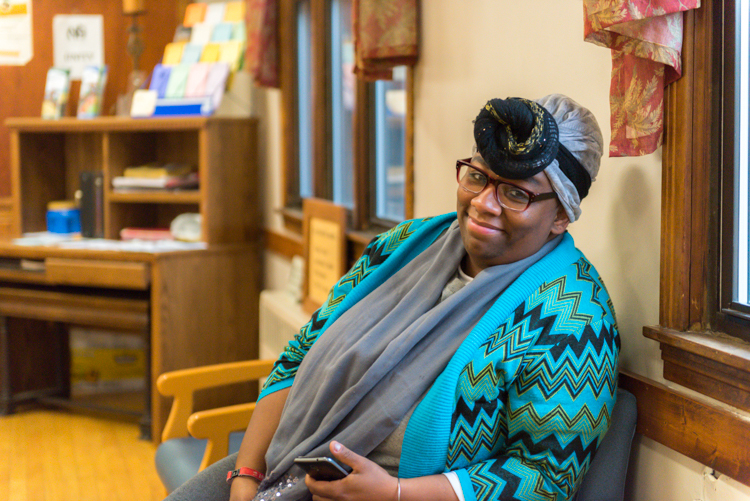 A big part of the answer lies in the Youth Empowerment Project [YEP] from Community enCompass, a Christian nonprofit that focuses on community development in Muskegon’s core neighborhoods. As part of YEP, high school students aim to empower themselves and their community through leadership development, rehabilitating houses owned by struggling homeowners in the Nelson neighborhood, tackling race relations, mentoring younger children, urban farming, volunteering, trips to visit colleges in Michigan and across the country, and more. 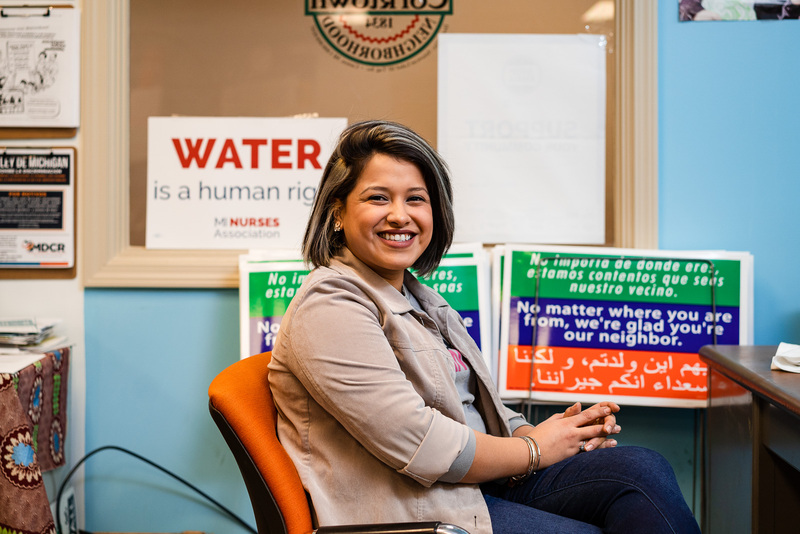 This evolution, Hernandez explains, changed her day-to-day life—and played a crucial role in shaping her aspirations for the future. 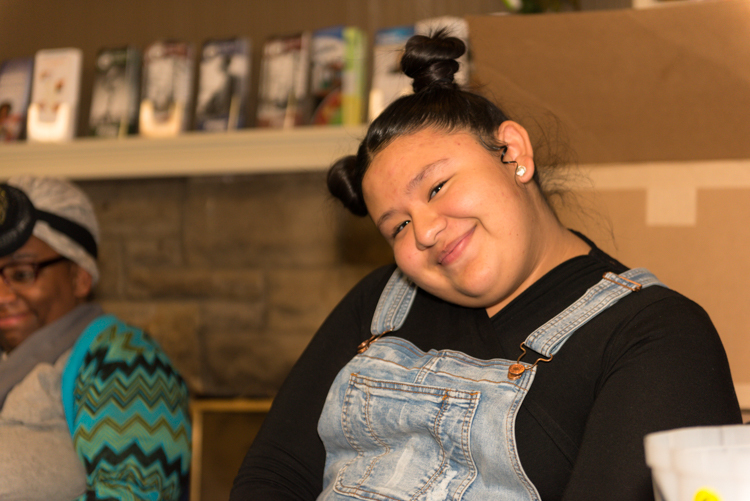 These stories are familiar ones to the 18 high school students involved in YEP, who attend Muskegon High School, Orchard View High School, Muskegon Covenant Academy, and the Muskegon Community Education Center. Each of their stories differ, of course, in their details, but they all have similar themes, narratives that are rooted in teenagers finding a place for themselves in a world that often doesn’t take them seriously, in overcoming struggle, in facing barriers stemming from the disenfranchisement that has left the students, as well as their families and neighborhoods, struggling with poverty, hunger, violence, and social isolation, among other issues. 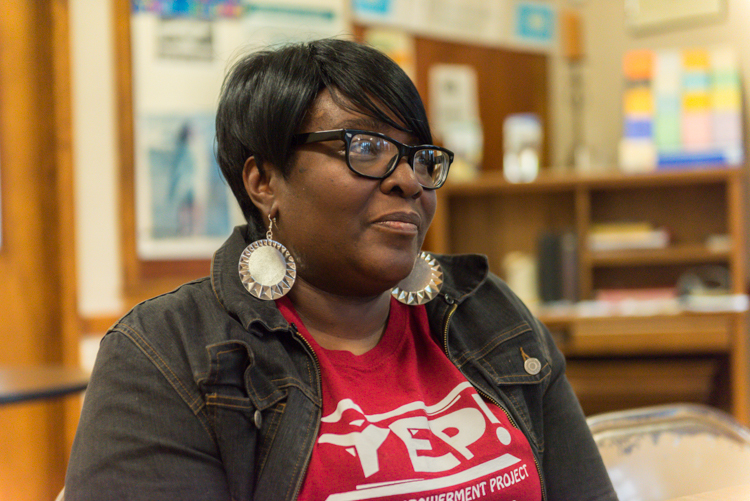 “My girls grew up in poverty; we didn’t have funds to give them allowances, but we were able to find money to give them for bringing home As,” says YEP Director Charlotte Johnson, a longtime civic leader who has lived in the McLaughlin neighborhood for 28 years. “My oldest daughter was valedictorian of Muskegon High School in 2014. She’ll be graduating from Michigan State this spring; she wants to go to New York to get her master’s to teach science. “I always told my daughters, and I tell the YEP kids, that poverty doesn’t have to define you; you can still achieve,” she continues. 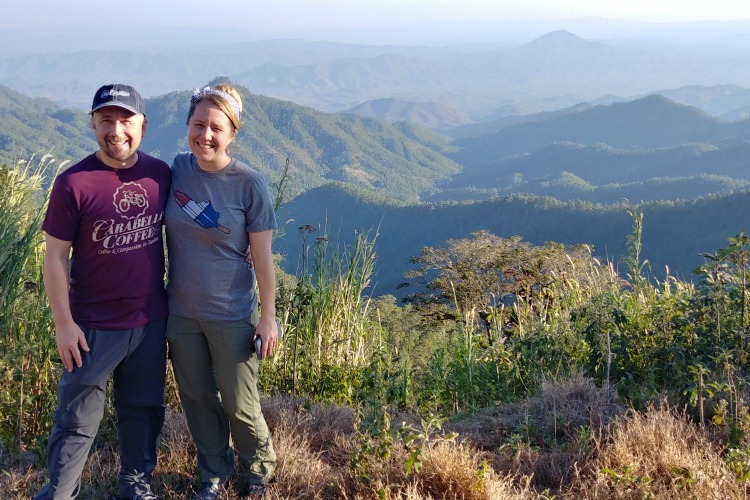 While struggle is certainly a part of the teenagers’ lives, their stories are also ones of great joy and triumph: of forging new friendships, of learning to speak up for themselves, of fighting for their community. And they’re not just lighting up Barnes’ life. Pay attention to their names; these are the students who are changing our city for the better. “They’re an amazing group of students,” Johnson says. “They’re very diverse: African-American, Hispanic, white. They feel there’s nothing they can’t do. They’re mentors to elementary students, they rehab houses, they’re working on addressing school policies they don’t like with the school board, they’ve made films, they go on college tours, they work at McLaughlin Grows Urban Farm. They do so much. Community enCompass originally launched YEP as the “youth employment and entrepreneurship program” in 2008. The program was born in response to numerous individuals throughout the McLaughlin neighborhood, in which the nonprofit largely focused its efforts at that time, telling the nonprofit there was not enough employment for youth in the area. At its inception, the program mainly worked with individuals 18 to 20 years old. In 2012, the initiative became YEP and switched its focus to working with students in high school. 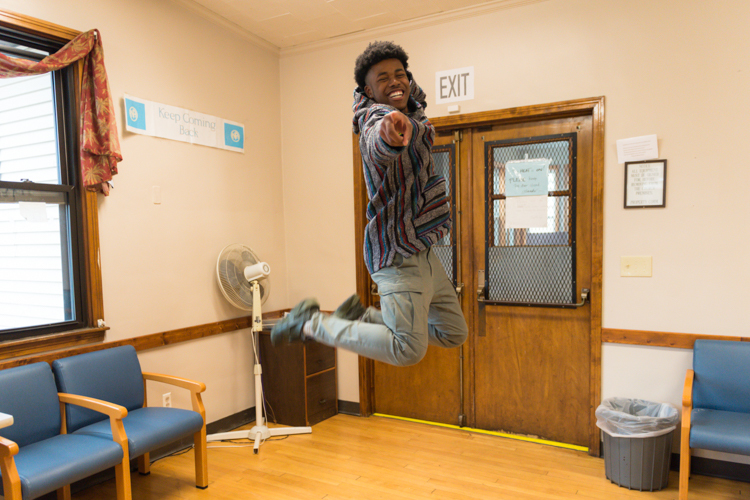 The program continues to offer opportunities for work, but it has increasingly expanded as well, and students in ninth through 12th grade now do everything from mentor younger students at an after school center to rehabilitate homes in the Midtown Square area of the Nelson neighborhood. The teens have volunteered in Muskegon Heights for Kids’ Food Basket, a nonprofit working to address food insecurity by providing free dinners; they’ve worked on a race relations program with the youth group at First Evangelical Lutheran Church in Muskegon and made films about suicide and why YEP matters to them. The students, many of whom are artists, have also conducted widespread efforts to connect the community to art and history, including by developing a mural honoring Frederick Douglass, Harriet Tubman, Barack Obama, and Charles Waugh, a local attorney, Muskegon Heights school board member, and president of the Muskegon branch of the NAACP. Unveiled this past summer, the mural covers a side of the King David Lodge building at Mason and 5th Street in the Nelson neighborhood. Additionally, YEP leaders work with students on preparing for college, from helping them apply for financial aid to bringing them on school tours. Each spring, the students visit colleges and universities—they’ve gone to Georgetown University, Howard University, Grand Valley State University, the Chicago Institute of Art, and Baker College, among many others. Johnson has also worked with students interested in the trades and has brought in entrepreneurs to speak to them about starting their own businesses. This past Wednesday, students discussed an application for a United Way grant that aims to help organizations working on income stability, education, school readiness, on-time graduation, post-high school success, and career awareness. They also tackled school policies students feel are unfair—such as Muskegon High School not permitting students to leave the campus, even when the cafeteria routinely runs out of food, leaving as many as 100 students without lunch on a regular basis, according to the teens. The students plan to attend an upcoming Muskegon Board of Education meeting to discuss a range of policies, and they hope the increased communication will lead to adults having a better understanding of the difficulties the teenagers face. Students have been particularly distressed that Muskegon High School implemented a policy that results in three late arrivals being counted as an absence. Terry emphasizes that YEP is a vital link between the general student body and the district leadership. “We can interpret [what students are thinking and feeling] in a calm way to address the School Board,” the Muskegon High senior says. 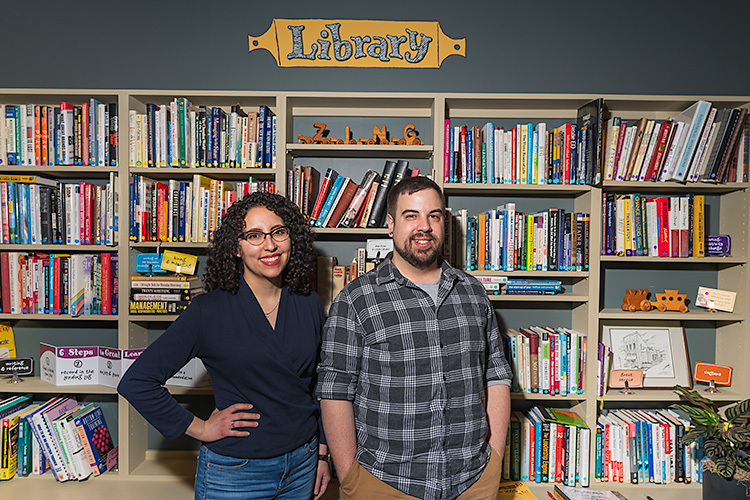 All of this work over the past decade has led to YEP members becoming some of the city’s strongest advocates for its residents and neighborhoods. YEP students attend the group's weekly meeting at Community enCompass. “YEP has now been in existence for 10 years. 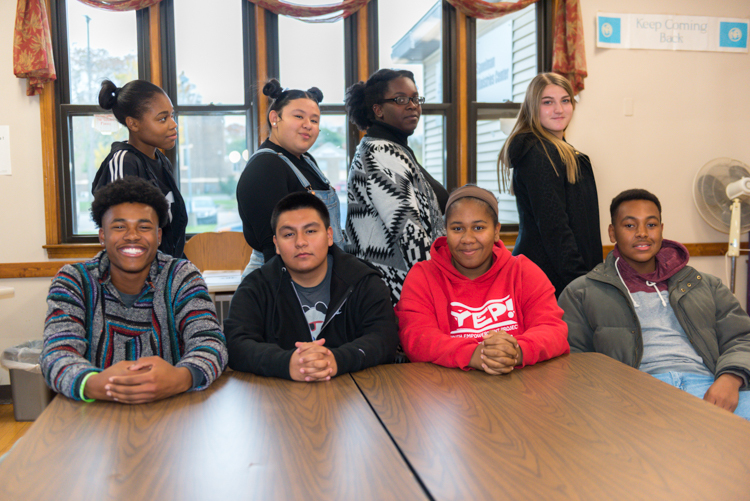 It’s really interesting to see the continuum; you’re working with elementary school kids who are saying, ‘I want to be a YEP one day,’ and then they go into the YEP program,” says Community enCompass Executive Director Sarah Rinsema-Sybenga. 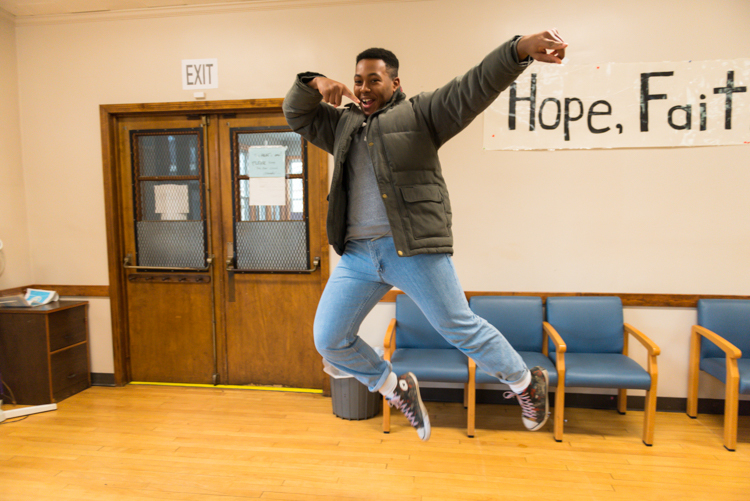 “YEPs graduate and go on to college, and they come back and participate with Community enCompass during the summer. Sitting at an extended table perched in front of a hand-painted sign that reads “Hope, Faith and Love,” the YEP students wrap up their weekly meeting last week by discussing their hopes for the future of Muskegon. Like their own goals, they are widespread: dreams for a city in which they have grown up. Harmon wants more businesses stay in the community, as well as expanded opportunities for recreation. Johnson would like better kept community gardens; Taylor hopes to see further employment, internship, and job shadowing opportunities for city youth. There is talk about addressing the food running out during Muskegon High School lunches, the need to tackle gang violence, and dreams of expanded arts, music, and dance programming in the public schools. A number of students also emphasize bullying must be dealt with in school. 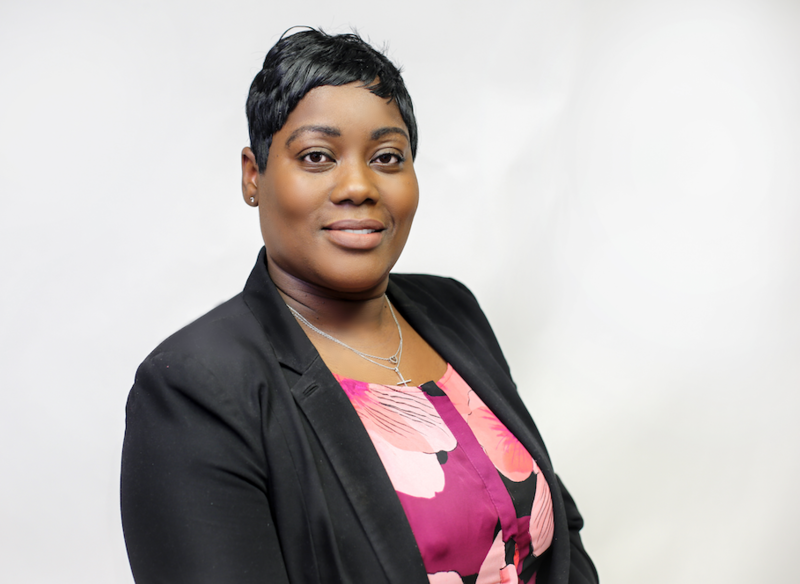 When it comes to Barnes’ wish list, she says the expansion of the YEP program throughout the city, including specific youth centers, would make dramatic improvements in the lives of city youth. “I really think we need to have a youth center where we can get more doors open than just the 18 students we have now,” Barnes says. “If we could get a larger place and more people involved, we can change more lives.